Do you ever have friends over to dinner and wonder if you’ve laid the place settings correctly? Or maybe you’re invited to a lovely restaurant and don’t know where to start when it comes to the cutlery! That’s me! Here’s your definitive guide to place setting etiquette. 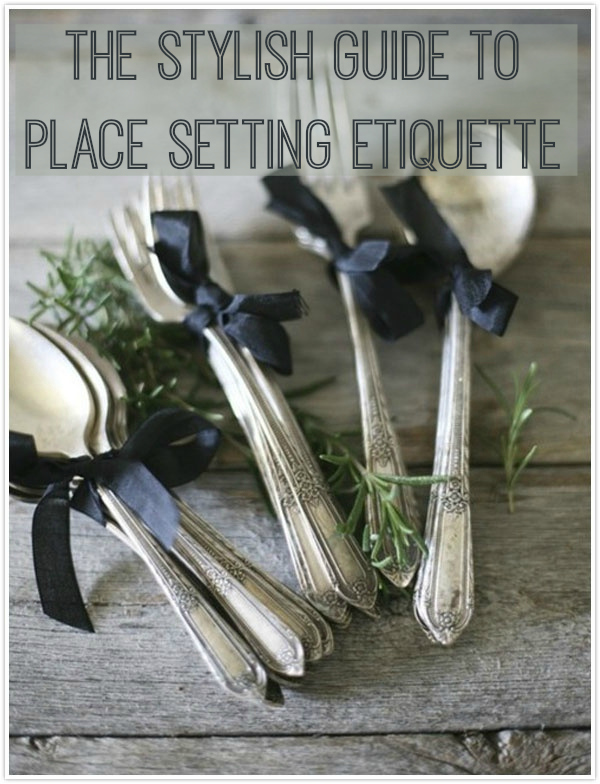 Knowing how to properly set a table has been a part of good etiquette for hundreds of years. It used to be that if your guests turned up to your party and your table wasn’t set properly, your reputation would be much maligned for the rest of the social season. There are three different types of place setting which are used in modern times; basic, informal and formal. Each setting is laid out in approximately the same format. The order, from left to right, is fork, plate, knife and then spoon. The side plate – which is used for bread and butter – goes on the left and the glass – for water or wine – goes on the right. Basic place settings can be used on an everyday basis and comprise just a knife, fork and spoon by way of cutlery, a large plate and a side plate, and a glass for the diner’s water or wine. One may opt to include a bread and butter knife with the basic place setting, however this is optional. The basic place setting is suitable for any type of occasion in which diners are not required to dress for dinner, however in the modern world it’s normal to see the basic table setting being used in nicer restaurants as well as at home. The informal place setting follows the basic layout as outlined above, however it should be modified to accommodate the serving of at least three courses. These include: soup, appetiser, entrée and dessert. To cater for this many dishes you may need to invest in more cutlery than one would typically buy, just for the home. 18 piece Viners cutlery sets are sure to provide you with all the pieces you need. For the informal place setting you will need two forks and two spoons, and the entrée plate should be placed to the left of the forks. This place setting is very rarely used. It comprises three forks, two knives, two forks and four glasses. The appetizer is always shellfish and the first course is always soup or fruit. These are followed by the fish course, the entrée and then a salad. This place setting also features another plate, called the ‘service plate’ upon which all other plates are placed. No more than three of the same utensil should ever be placed on the table at one time. Gosh I get in such a pickle over which spoon to use! Hehe, I know, it’s so confusing! Sadly this is becoming a lost art among new generations I fear!